Liquid crystal shells have several properties that could be utilised within the autonomous and robotics markets, claim scientists from the University of Luxembourg. 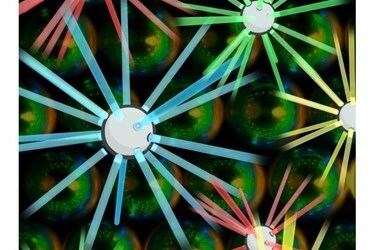 The team discovered that as these shells reflect light highly selectively, they can be arranged into patterns that are readable for machines, akin to a QR code, adding coded information to objects. "These patterns could be used to guide autonomous vehicles or to instruct robots when handling workpieces in a factory. This could become important especially in indoors applications where GPS devices don't work," Professor Jan Lagerwall of the University of Luxembourg explains. According to the scientists, the shells can be manufactured to reflect only certain wavelengths of light, such as infrared, that would be invisible to the human eye. As the liquid crystal shells reflect light "omnidirectionally" meaning that beholders see the same pattern regardless of their position and viewing angle, the patterns can even be read by moving objects. Additionally, the team say th shells can be manufactured in a way that they change their structure when they are exposed to certain external impacts, such as pressure, heat or specific chemicals. The belief is that, together with computers to interpret these changes, the shells could be used as sensors. For example, implemented as pressure sensors in the fingertips of robots, enabling tactile feeling – a current challenge in robotics engineering. Another application could be fire exit signage on walls inside buildings that only becomes visible when the temperature exceeds a certain threshold. The big advantage of these sensors, according to the team, is that they passively react to external impacts and don't need electricity and batteries. The team also believe that liquid crystal shells could be used to prevent counterfeiting. The micropatterns that emerge when the shells are brought together are said to be “unique and impossible to copy.” These unclonable patterns could be used to create uncopiable identifiers that can be attached to valuable objects. In combination with cryptographic tools they could be used to create a system that ensures that a buyer or user has the original and not a counterfeited product. Prof. Lagerwall makes clear that the ideas require further research, but the hope is that the article can "stimulate future research”.